A "Dialog" is a little window that pops up which contains some buttons that you can click. 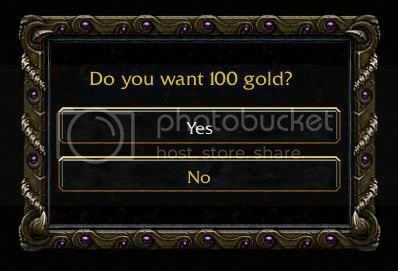 An example of what a Dialog can be used for is a simple thing like if you would like to have a 100 gold. Instead of having the choice based on chat commands where you write -yes or -no it is (and looks) better to have a Dialog window appearing asking you if you would like to have a 100 gold and then having 2 buttons which says "Yes" or "No". We will now show you how you make a Dialog like I just told you about in the simpliest way (that we know of). To get started you should (of course) open up the World Editor and enter the Trigger Editor (Hotkey for it is F4), the icon for it is located in between the Terrain Editor & the Sound Editor. When you are inside the Variable Editor you click on the green x with a + in front of it to create a new variable, then you make the two variables needed for the Dialog as shown below. 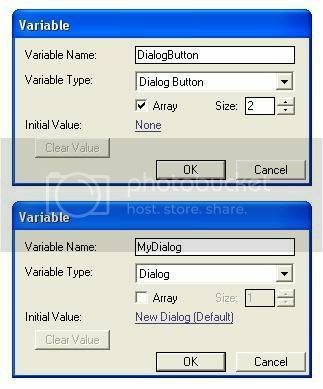 Once you made your two variables you can start with the actual triggers for getting the Dialog Window to appear. Once this is done the Dialog will appear perfectly but there will be no effect when clicking the buttons. Once these two triggers have been made your Dialog should work and look like shown below.